Beaverton, OR: This May Day, my city resolved to affirm that Black & Brown Lives Matter in our community. Poets often sit with a word or phrase for hours, considering its aptness; with this resolution, city staff, leaders, police, the Human Rights Advisory Commission (HRAC) & community members acted in part as poets looking at language. Representatives said they analyzed it for nearly a year before bringing it to council. Good work, replete with courageous conversations, in City of Beaverton! Street window reflection. Flag is inside; flowers & me, outside. Meanwhile, I’ve been attending Beaverton’s Bicycle Advisory Committee meetings, going on two years now. I don’t own a car, & I go to represent people like myself, who use bicycles as transportation in Beaverton, greater Washington County, & to commute to Portland. When it comes to bicycles as transportation, research shows there’s safety in numbers. The above mentioned HRAC Resolution represents an important factor in comfortable biking for all, & I’m grateful it passed. Some know that intersection better than I do, and I try to listen to advice from around the country. Here are some words from Slow Roll Chicago. Another resolution on the table at Tuesday’s council meeting was a ban on street camping. That ban is related to something I’ve written about before, our region’s longtime housing crisis; it relates to safety & use of streets, and our value of inclusion as the city grows. I know the answers aren’t all there—at least, I don’t have them. Some involve money; some depend on law & city responsibility; some concern our spirit of community—which, in suburbs made car-dependent, can be difficult to cultivate. But once there’s an ordinance against street camping, it seems it’d be hard to undo whatever that ban sets in motion. Ironically, a ban would recognize that streets are publicly owned & funded, and not just by consumers of our nation’s heavily subsidized gasoline. 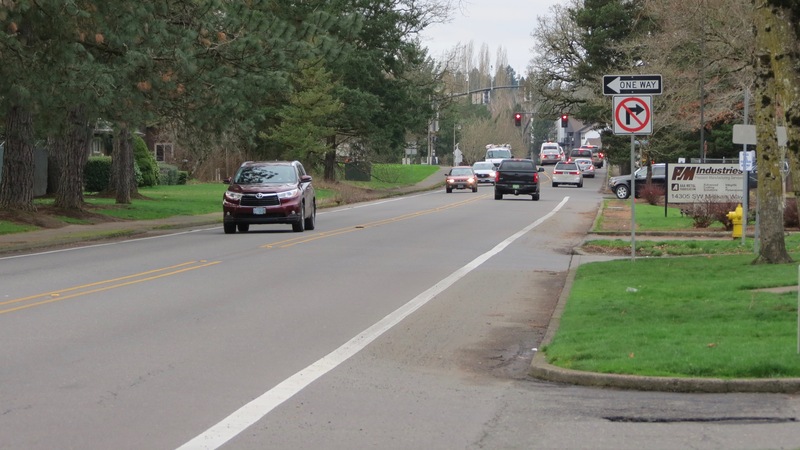 A local government exercising such oversight over roads signals that socially, economically, & politically, these roads belong to all Beavertonians & our guests—including those temporarily parked and living there. As long as we’re a democracy, the government’s made up of all of us. Roads are a socialist invention, paved over by the private-public partnerships that widely displaced all vehicles but motored (at least here in America). is a river of motors, their flow sacred, their roar omnipotent. a public street is private property? Hard to say what a permanent camping ban truly promotes, ideologically speaking. Is a ban for sure needed? Police are already in the community, policing public areas, patrolling streets for safety. I believe many officers entered the profession because they want to protect people who aren’t safe. I’ve asked myself: “What would motivate me to become a police officer?” Because I also think that institution—law enforcement—invites failure as much as heroism. Does the job still attract good officers in cities where it’s become more about protecting storefronts than the bodies & hearts of civilians? Many people have turned understandably afraid of police, even when neither party’s doing anything wrong. Such fear seems likely when “home” is a trailer, on a city street. 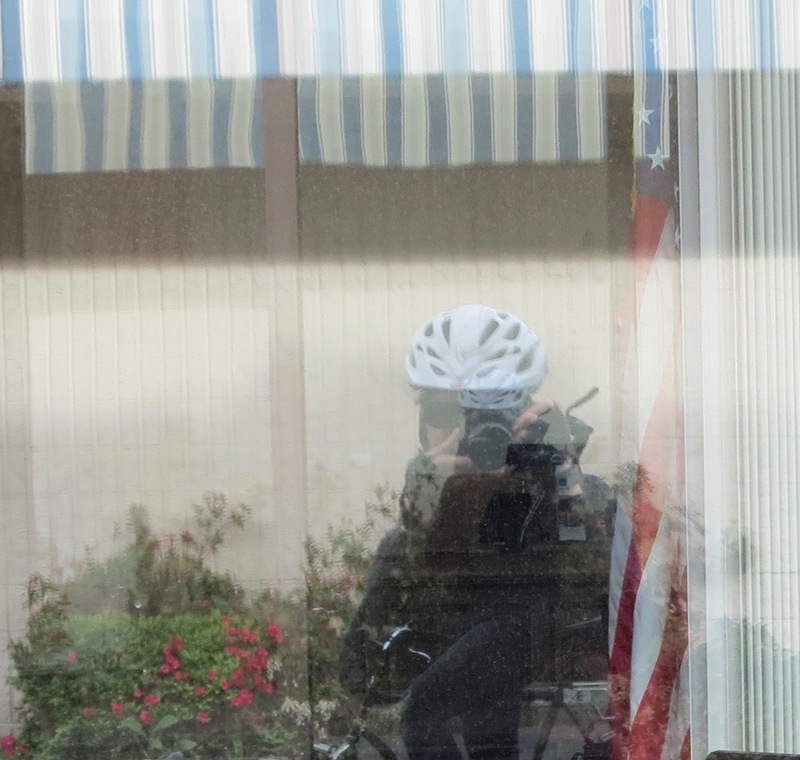 I know there are factors and implications completely outside my awareness—like that American flag inside a building, leaned against the window, that I only noticed when I stopped to look at my reflection. To be honest—& this is just me thinking individualistically—I wonder if it’d make me feel safer on bike (no risk of doorings) & more visible (less chance of a driver leaving a parking lot not seeing me) if there were no on-street car parking allowed, none at all, especially not for people who already have homes. I see cars & our wide, land-hungry arterial roads as a cause of our housing problem. Free parking; expensive housing. To further weave these matters—there is prejudice out there against people who bike. I have no way of knowing if this is regularly true for people driving cars, but in Beaverton, there are high odds a police car shows up when I’m biking down the street. It’s happened more when I’m wearing my black jacket than my yellow one. I admit, based on vibes I’ve gotten, I’ve assumed some jumpy resident or business owner stereotyped me & called to report me. Took some getting used to; this didn’t happen to me in Portland! I’ve also considered that maybe Beaverton just has much more police enforcement on the roads; that they’re there to keep me safe. These days I’m mostly just grateful for their presence, because too many people—maybe even the same folks who’d report seeing me tooling down the street on my bike—still drive distracted & too fast if police aren’t around. About ten years ago, when I still had my 90s Thunderbird (RIP), I got pulled over on Cedar Hills after exiting the 26, for a rear turn signal being out. An electrical problem made the bulb burn out repeatedly. The officer saw I was driving safely otherwise and gave me a warning, with my promise I’d fix the light (I went through so many lightbulbs in that car). I’m left feeling positive about the incident; I think it’s good for other drivers’ safety I was pulled over for that. Again, this happened in Beaverton, not Portland. Routine traffic stops don’t always go so well. Back to biking, people’s narrow-mindedness is real. I’ve read enough compassionless comments online revealing that old prejudice of associating people on bicycles with meth. Nope. People who find themselves addicted to meth, as a two-second online search reveals, drive cars, often as not. Something to think about. There’s also the preconception that we who use bicycles do so because we lack a driver’s license for some nefarious reason. Nope again. My driver’s license is valid, not that it’s anyone’s beeswax. It’s a pretty awful feeling to be profiled, stared at, whispered about, followed, as you innocently look for a jar of paprika or try to decide on a flavor of locally made soap. Yep. I took a costume design class in school, so I know I can get in a car wearing expensive-looking clothes & I’ll be seen differently instantly. But I’m not on stage. I’d rather be accepted as normal when on bike; I’d rather walk into a store with my backpack & friendly people inside know it’s a normal way to shop for groceries. I’m glad Beaverton’s leaders understand & support the spirit of that wish for kindness, shared by people regardless of race or status. Passing resolutions affirming everyone’s right to feel welcome—naming specifically those who’ve been systemically oppressed—is only a start, but what leaders affirm, promote, & resolve for our city can give light to shadows. I do understand the instinct to avoid disrupting longtime residents used to a certain way, who’ve invested in that way of life only to feel unsettled by change, who, for one example, want driving to return to the easy, carefree jaunt to the store it once seemed to be. I also know we’ve got to keep pushing for social evolution, for fairness, to give people a chance to make it, including those who don’t have cars or big salaries or even homes. There are a lot more people here now, newcomers. But we have thoughtful & visionary leaders in Beaverton, and a whole lot of vibrant community members to help guide them. Trust between the two is how to walk the tightrope. Just like with bike lanes made of paint. When the trust trails off… On this Beaverton bike lane on Millikan, the paint trails off just before the intersection with Murray. It suggests drivers can immediately cut right, with no Yield to Bicycles sign, just that big “one way” sign. Maybe Beaverton businesses would get behind a Ban On Streets that aren’t made for everyone’s safety—like safety of kids who might be riding their bicycle to or from school, the Beaverton library, or to a Beaverton business that hosts events for kids, such as Northwest Fencing Center.